Thomas Cashes For $20K At SFG Super Bowl At The Rock! 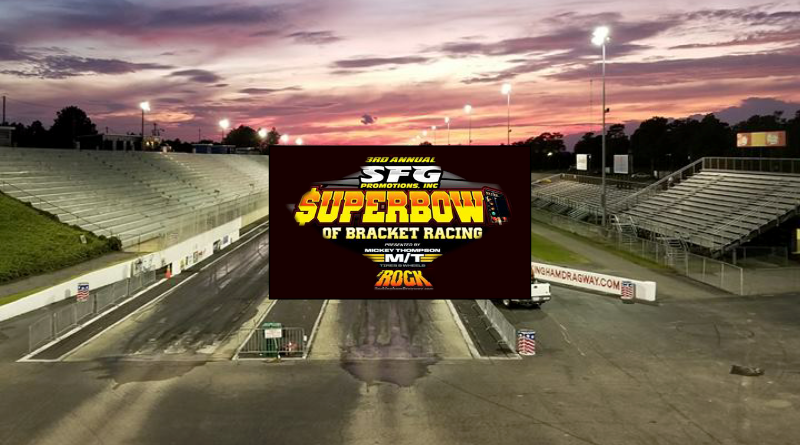 ROCKINGHAM – Fairmont’s Eric Thomas got a win for the door cars Thursday when he outpaced Raleigh’s Gary Ingold in the final round to claim the $20,000 top prize on Day 2 of the SFG Super Bowl of Drag Racing at Rockingham Dragway. The pressure mounts today through Sunday when the winner’s share swells to $100,000. The format remains the same with the door cars and dragsters separated until the late rounds. Thomas put together a .014 package in the final to turn back Ingold, a Rock regular, who was uncharacteristically .033 off his target number. Semifinals – Eric Thomas, Fairmont, def. Wes Neely, no time; Gary Ingold, Raleigh, .020, 4.644 on a 4.630, 145.50 mph, def. Curt Harvey II, no time. FINAL – Eric Thomas, Fairmont, .012, 5.632 on a 5.630, 121.44 mph, def. Gary Ingold, Raleigh, .019, 4.663 on a 4.630, 147.25 mph.